WEDNESDAY 07 – JAN09: After work I go walking around Arlington looking for the barbershop. The neighborhood is in transition. It is a mix of gleaming modernity, like the George Mason law school, and old vernacular bungalows with front stoops and character. Right next door to our lodgings is an old single-family stand-alone house that has been converted into the local American Legion Hall. I stop in to say hello. It is the Billy Mitchell Chapter, named in honor of that pioneer American army aviator. His portrait in uniform is on the wall. A game of darts is underway. Football is on in one corner television, the evening news on the other. They are happy to see me, and give me more directions to the barbershop than I will ever need. They are keen on watching the DC inauguration news, and as I’ve observed elsewhere, there is a hopeful atmosphere of renewal. I am advised the Chapter grills steaks every Sunday, that they are the best around, and invited to return. Read more about Billy Mitchell by clicking on read more. Billy Mitchell is the most famous and controversial figure in American airpower history. The son of a wealthy Wisconsin senator, he enlisted as a private during the SpanishAmerican War. Quickly gaining a commission due to the intervention of his father, he joined the Signal Corps. He was an outstanding junior officer, displaying a rare degree of initiative, courage, and leadership. After challenging tours in the Philippines and Alaska, Mitchell was assigned to the General Staff-at the time its youngest member. He slowly became excited about aviation-which was then assigned to the Signal Corps-and its possibilities, and in 1916 at age 38, he took private flying lessons. Arriving in France in April 1917, only a few days after the United States had entered the war, Lieutenant Colonel Mitchell met extensively with British and French air leaders and studied their operations. He quickly took charge and began preparations for the American air units that were to follow. The story of American aviation mobilization in World War I was not a glorious one. It took months before pilots arrived in France and even longer for any aircraft. Nonetheless, Mitchell rapidly earned a reputation as a daring, flamboyant, and tireless leader. He eventually was elevated to the rank of brigadier general and commanded all American combat units in France. In September 1918 he planned and led nearly 1,500 allied aircraft in the air phase of the SaintMihiel offensive. Recognized as the top American combat airman of the war (he was awarded the Distinguished Service Cross, the Distinguished Service Medal, and several foreign decorations), Mitchell, nevertheless, managed to alienate most of his superiors-both flying and nonflying-during his 18 months in France. 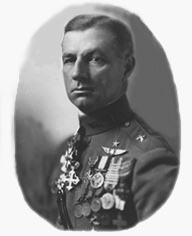 Returning to the US in early 1919, Mitchell was appointed the deputy chief of the Air Service, retaining his onestar rank. His relations with superiors continued to sour as he began to attack both the War and Navy Departments for being insufficiently farsighted regarding airpower. His fight with the Navy climaxed with the dramatic bombing tests of 1921 and 1923 that sank several battleships, proving-at least to Mitchell-that surface fleets were obsolete. Within the Army he also experienced difficulties, notably with his superiors Charles Menoher and later Mason Patrick, and in early 1925 he reverted to his permanent rank of colonel and was transferred to Texas. Although such demotions were not an unusual occurrence at the time-Patrick himself had gone from major general to colonel upon returning to the Corps of Engineers in 1919-the move was nonetheless widely seen as punishment and exile. Not content to remain quiet, when the Navy dirigible “Shenandoah” crashed in a storm and killed 14 of the crew, Mitchell issued his famous statement accusing senior leaders in the Army and Navy of incompetence and “almost treasonable administration of the national defense.” He was courtmartialed, found guilty of insubordination, and suspended from active duty for five years without pay. Mitchell elected to resign instead as of 1 February 1926 and spent the next decade continuing to write and preach the gospel of airpower to all who would listen. The election of Franklin D. Roosevelt, a Navy man, was viewed by Mitchell as advantageous for airpower. In fact, he believed the new president would appoint him as assistant secretary of war for air or perhaps even secretary of defense in a new and unified military organization. Such hopes never materialized. Mitchell died of a variety of ailments including a bad heart and influenza in 1936. There are several biographies of Mitchell, and the most balanced and useful treatment of this important airman is unquestionably Alfred F. Hurley’s, Billy Mitchell: Crusader for Air Power, revised ed. (Bloomington, Ind. : Indiana University Press, 1975). Hurley deals sparingly with the general’s early career and personal life, concentrating instead on his war experiences, the postwar years, and his theories of airpower employment. Mitchell was the first prominent American to espouse publicly a vision of strategic airpower that would dominate future war. He believed that aircraft were inherently offensive and were strategic weapons that revolutionized war by allowing a direct attack on the “vital centers” of an enemy country. These vital centers were the mighty industrial areas that produced the vast amount of armaments and equipment so necessary in modern war. He did not see this as either illegal or immoral. In fact, given the trench carnage of the First World War that slaughtered millions, he argued that airpower provided a quicker and more humane method of waging war. To carry out effectively this mission of strategic attack, he argued that it was necessary to separate aviation from the Army and Navy because they were too traditional and surfaceoriented. Mitchell’s persistent jibes at the Navy were especially nasty, and Hurley argues they not only fostered bitter interservice rivalry but also spurred the Navy to greater efforts in developing carrierbased aviation-the precise opposite of what Mitchell intended. Nonetheless, Hurley concludes these shortcomings were more than balanced by a vision and foresight regarding the future of war, later proved substantially correct, that sustained the fledgling air force during its early and difficult years. There are several other published accounts of Mitchell’s life; most are hagiographies written during or soon after World War II that depict him as a prophet without honor and as a martyr for airpower. Surprisingly, few even discuss his airpower theories and concentrate instead on the sensational aspects of his career. Of this genre, the best is Isaac Don Levine’s, Mitchell: Pioneer of Air Power (New York: Duell, Sloan, and Pearce, 1943; revised in 1958 but without significant new material). Levine reveals Mitchell’s personal life, including his early years as a junior officer, basing his story largely on letters and interviews. Although no footnotes or bibliography are included, Levine obviously did a great deal of research. Unfortunately, besides employing an overly breathless prose, the book suffers from a strong bias: Mitchell is glorified and his very real character flaws are ignored. Mitchell was vain, petulant, racist, overbearing, and egotistical. Although his aggressive advocacy of airpower was entertaining and won much publicity, it is questionable if his antics actually swayed public opinion or that of Congress. Indeed, it could even be argued that his incessant and vicious attacks on the Navy did more harm than good and induced an animosity between sailors and airmen that has never really abated. Three biographies that are, frankly, of little value are Emile Gauvreau and Lester Cohen, Billy Mitchell: Founder of Our Air Force and Prophet without Honor (New York: E. P. Dutton and Company, Inc., 1942); Roger Burlingame, General Billy Mitchell: Champion of Air Defense (New York: McGrawHill, 1952); and Ruth Mitchell, My Brother Bill: The Life of General “Billy” Mitchell (New York: Harcourt, Brace, and Jovanovich, 1953). This last does, however, quote heavily from Mitchell’s unpublished manuscript describing his tour in Alaska from 1901 to 1903. This littleknown story of the Signal Corps’s efforts to string a telegraph line across the territory is quite interesting. Another work that is a cut above those just mentioned is Burke Davis, The Billy Mitchell Affair (New York: Random House, 1967). This treatment is unique in that it covers in some detail Mitchell’s famous report of his visit to Hawaii in 1924 in which he predicted a future war with Japan that opened with a carrierbased air attack on Pearl Harbor. In addition, Davis had access to the transcript of Mitchell’s courtmartial. His coverage of that event is fairly extensive, and although his treatment is evenhanded, it tends to put the airman in a favorable light and as a victim of Army conservatism. A doctoral dissertation that takes a different view of the court proceedings is Michael L. Grumelli, “Trial of Faith: The Dissent and CourtMartial of Billy Mitchell” (Rutgers University, 1991). This is an interesting and detailed account of Mitchell’s 1925 trial for insubordination that argues the general was convicted not only because he was guilty as charged but also because his defense lawyer was woefully inept. Bungled crossexaminations and a clever prosecutor produced testimony from expert witnesses that revealed virtually all of Mitchell’s charges of military incompetence and negligence to be unfounded. Grumelli concludes that Mitchell’s decision to provoke a public courtmartial was a serious miscalculation that quickly revealed his “tremendous arrogance, extreme selfrighteousness, gross exaggerations and blatant inaccuracies.” He further concludes that Mitchell, who was surprised at his conviction, spent the rest of his life vainly seeking vindication, but instead found himself fading quickly into obscurity, devoid of either influence or importance. His rejection by Roosevelt for a senior post in the administration was the last straw. Raymond R. Flugel’s PhD dissertation, “United States Air Power Doctrine: A Study of the Influence of William Mitchell and Giulio Douhet at the Air Corps Tactical School, 1921-35” (University of Oklahoma, 1965) argues that there was a direct link between the two air theorists. Flugel even argues that Mitchell’s writings owed a heavy debt to Douhet, a debt never acknowledged. He bases this charge on the discovery of a partial translation of “Command of the Air” (published in Italian in 1921) in the Air Service archives that was dated 1922. This was at least a decade prior to the translation of a French edition done for the Air Corps by Dorothy Benedict and George Kenney. Unfortunately, this discovery, which is indeed an important one, is totally wasted by the author’s flawed methodology. Flugel attempts to show plagiarism by a textual analysis of “Command of the Air,” Mitchell’s writings of the mid1920s, and the textbooks of the same era. He actually reproduces several paragraphs, underlining similar words and phrases to show their similarity. However, instead of using the newly discovered 1922 translation-which presumably would have been available to Mitchell-Flugel instead relies on the Dino Ferrari translation of 1942! Because the two versions have significant differences, Flugel’s charges remain unproven. Published over two decades after his death are Mitchell’s Memoirs of World War I: From Start to Finish of Our Greatest War (New York: Random House, 1960; parts of the diaries were serialized in Liberty magazine in 1928). This is a compilation of his experiences in France from April 1917 to the armistice based on the diaries he kept at the time (now lost). As with any such work, it is not clear how many of the opinions and predictions presented here were of later device. Not surprisingly, Mitchell comes across looking quite prescient as to the unfolding of the war. There are, however, some notable aspects to this book. The distaste and low regard Mitchell held for Benjamin Foulois, his nominal superior, is apparent. It is a pity that two of the most senior and most important American airmen, who should have been close allies in their advocacy of airpower, were bitter enemies. Also apparent is Mitchell’s remarkable curiosity about all things regarding air warfare. This book is replete with descriptions of myriad and diverse details such as what time weather reports arrive at a fighter squadron and in what format, the construction of the shock absorbers on a captured German aircraft, and the type of parachutes used by balloon observers. One other revealing aspect of this memoir is Mitchell’s already emerging disdain for “nonflying officers” in Washington who “know nothing about airpower,” yet try to direct its course. According to this book, Mitchell returned to the United States in 1919 already convinced of the need for a separate service liberated from the control of narrowminded surface officers. Another of Mitchell’s own works that should be noted is his General Greely: The Story of a Great American (NY: Putnam’s, 1935). Adolphus W. Greely was one of the more interesting characters of his era. He fought in the Civil War, strung telegraph wire across the southwest United States, and was an internationally known Arctic explorer. In 1887 he was promoted to brigadier general and named Chief Signal Officer of the US Army, a post he held until his retirement in 1906. During those two decades he modernized the Signal Corps dramatically, but perhaps most significantly by pushing for a rejuvenation of the Balloon Corps and by encouraging experimentation in heavier-than-air flight. Although he had retired before the Wright Brother’s had sold their first airplane to the Army’s Signal Corps, Mitchell credits him for creating an atmosphere of innovation that made such a contract possible. Of importance, Mitchell uses this biography as a vehicle for recounting some of his own experiences as a junior officer in Greely’s Signal Corps. As a result, Mitchell gives us some insights into his activities during the Spanish-American War, his tour in the Philippines during the insurrection there, and of his rugged adventures in Alaska. Mitchell wrote this biography in 1935, the year Greely died; it came out in print the following year, soon after Mitchell’s own death. The conclusions and opinions expressed in this document are those of the author cultivated in the freedom of expression, academic environment of Air University. They do not reflect the official position of the US Government, Department of Defense, the United States Air Force or the Air University. This entry was posted in Current Affairs & History and tagged Anthony Atwood. Bookmark the permalink.